down corruption practices in the country and also the converning fradulent acts. There is God o! Lets stop deceiving our selves!! 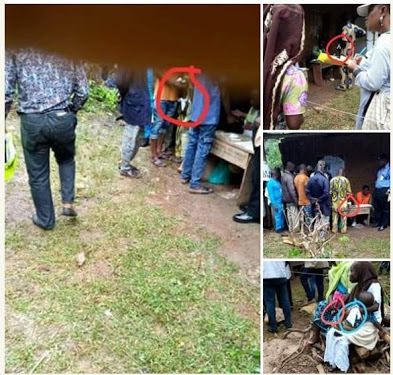 The lead of the Osun Rerun race was bad to the point that, in places where the APC, back by Police and other security specialists, couldn't prevent villagers from getting to the polling unit, they paid for their votes straightforwardly with exemption. The vote-buying symbol is White Handkerchief as seen in the photos above. The Nigeria Policemen on duty were all working for APC, once they see a person with White Handkerchief it's a signal that he/she will vote for APC. The United States, the United Kingdom and the European Union observer team has said it would investigate reports of irregularities in the Osun state supplementary governorship election. A member of the team told reporters in Osogbo, the state capital, that they heard about irregularities, harassment and interference by inappropriate persons in the election. “We are very concerned by these reports and will be checking the facts with stakeholders. We call on all stakeholders to remain calm,” he said. Late last night, the US led team addressed journalists at the INEC collation center and described the election as a Total Charade. The head of the team was so angry at the conduct of INEC officials and the Police during the election that he just walked away after speaking to the press.